It wasn’t too long ago that I was talking with someone and they started describing something they saw and didn’t know the right words to use. They wanted me to understand, but it was sort of like they were speaking a different language. They were talking about a town I hadn’t been too but they knew it had something to do with farms so we both thought we would focus on it and figure it out. The “it” was a really big building. It was right there on the river. You know the big building. It’s really white. 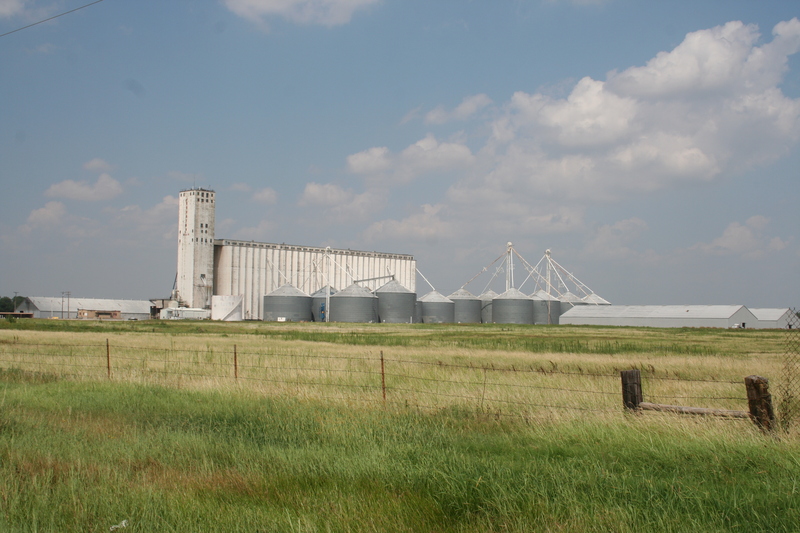 I’d never been to that town and yet I had been to every town and seen “it.” The “it” being a grain elevator — the storage facility for corn, soybeans, wheat and rice. 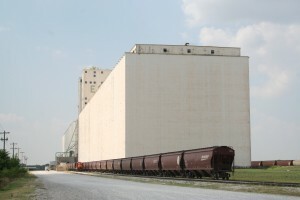 My first chance to be in the world of grain elevators was while I was in college in Oklahoma. I got used to the elevator on the horizon. 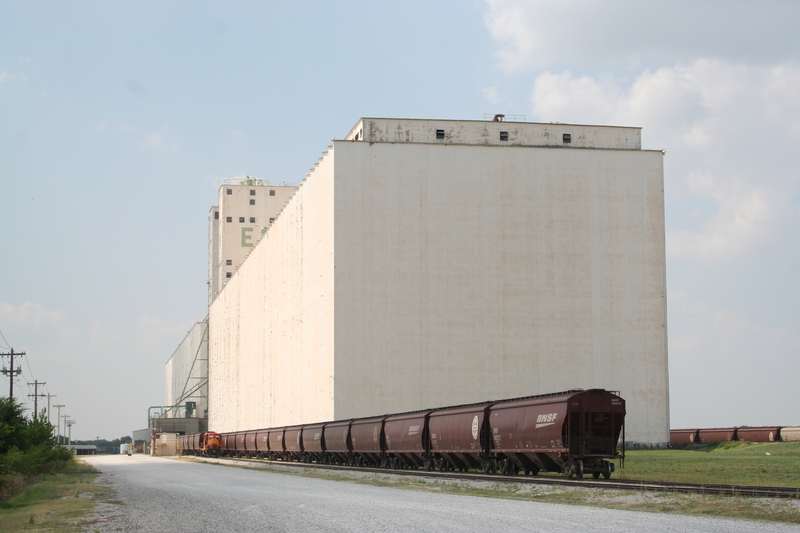 Enid, Oklahoma was the Wheat Capital of the US so the elevators there were hulking masses. And in the photo on the left, you can see grain bins in the foreground. 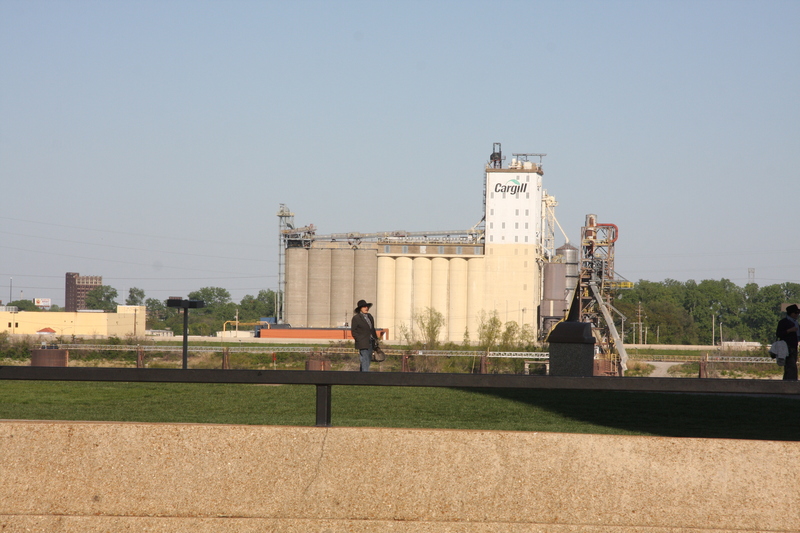 Now I live in a river city and as you can see, there are grain elevators nearby! 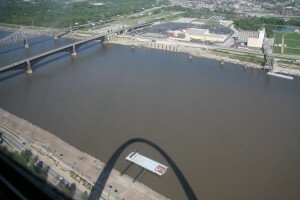 When you go up in the city’s most recognizable landmark, the St. Louis Arch, you see elevators just across the river, and from the base, its clear how close they are! Tons of bulk grain move through elevators as farmers from throughout the area, bring their crops to elevators to be sold. Elevators are virtually always on a major river or a railroad line because transportation is so critical to getting the crop to market. I don’t feel like I can stop my post on the letter E without acknowledging there were several other words to consider. 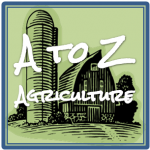 The biggest one was the environment as farmers need to work within the environment, making choices that will insure our planet can produce food for generations to come, but there are so many areas of the environment involved in agriculture that I think I could do an entire A to Z on ag & the environment. I could do earthworms. Yesterday I did an economy related piece talking about debt. And there are all types of farm equipment my friend Al Winmill pointed out. And ewes are really cute and produce wool! But elevators seemed a good fit for the series. Tomorrow (Saturday) is the day for the letter “F” so what do you think the word of the day should be? wow! I am impressed with the elevator. I am fascinated with all the aspects of super farming. Those elevators serve a large region. There are smaller ones out in small towns that funnel into the big ones on the main rail lines. Its really a complex system that I knew nothing about til I was in college! Thank you! I love taking photos! 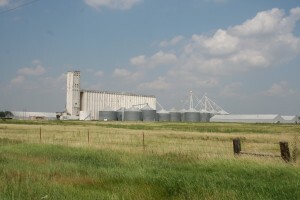 I had never seen a grain elevator, either! They are monstrous for sure. Thanks for sharing your thoughts about them. I love sheep too. In fact, they’re so cute that there’s one named Wooliam in my book, Charlene the Star and Hattie’s Heroes. If you’d like to find out more about my books, please visit: http://www.dhdunne.blogspot.com. The book has just been released on Kindle. WoolIAm! That’s an awesome name for a sheep! Will check out your site too! Thank you so much, Janice. Wooliam’s name was really my husband’s idea so he gets the credit. If you visit my page, you’ll see some of the things Wooliam and his friends say and think. They are an incredible team. Thanks in advance for visiting. Very cool. I have a metal deck rooster I named JZ because the Bloggess named hers Beyonce. That’s cute about the rooster, Janice. Thanks for telling me about it. Nice shot! Love how the pickups provide the scale for the photo too! If you come across odd sights in the backroads and aren’t sure what they are, feel free to get a photo & get in touch. I’d be glad to help you solve a mystery! I like that you chose elevator. I’ve seen those buildings, as well, but never knew quite what they were for. Thanks Jessica for coming by and taking the time to comment! I look forward to seeing what you are up to with your A to Z project as well! Janice – thank you for reminding me of one of the landmarks that told us we were “home”. Farmland, Marshall building & union Equity told me my many hours in the car had nearly come to an end! Yes indeed! The skyline was definitely a unique one. I followed you back here from your comment on my A-Z blog post. I share your love of travel. And I’m very familiar with those huge elevators – we’ve got plenty of them in Canada too. Great post! Thanks Faye! Nice meeting you and I appreciate your love of travel! We will have to compare notes on where we’ve been though I see quite a few in your blog I’ve yet to make! I’ve had a similar conversation with someone, except they assumed they were old missile silos! There are lots of people who probably drive by them everyday and don’t realize what they are. You are probably right then again, I’m sure there are things that are everyday happenings for me and yet unfamiliar to folks in rural areas. Its part of the reason I think being on social media is so cool…. I can learn and share a bit of the stuff I’ve already picked up too! 🙂 Thanks for coming by Kara!